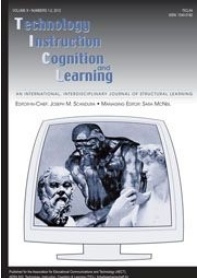 Technology, Instruction, Cognition and Learning (TICL) is an international, interdisciplinary journal of structural learning – promoting and disseminating interdisciplinary advances in theory and research at the intersection of four focus disciplines: Technology, Instruction, Cognition and Learning. Important developments in both theory and software technologies open a plethora of new opportunities for scientific and technological advance barely foreseen even a few years ago. TICL’s vision is to improve interdisciplinary communication and to promote scientific dialogue on fundamental issues and technological developments having important implications for future advances. TICL seeks articles that address such basic questions as how to represent knowledge, how determine what an individual does and does not know, how humans use existing knowledge to acquire new learn, and how knowledge may be increased through teaching and/or interaction with the outside world. Theory, research and technological innovations resulting in or leading to automation are especially encouraged. Particular importance is given to scientific and technical contributions that add to current understanding and have practical significance for cognitive, learning and instructional technologies. The goal is to promote work that is cumulative in nature, progressively increasing depth of understanding and automation. AECT members can Click Here for Online Access.